Tyvek Wristbands - Get Free Shipping on Tyvek (Paper-like) bands! Tyvek® wristbands are affordable, durable, and secure. The specially formulated security adhesive assures maximum security in any environment. The paper-like material is comfortable and easy to wear. Cost effective, durable and secure! Save the World, Don't Litter! Tyvek® wristbands provide an economical and secure way to identify customers and patrons across countless types of events. Often referred to as paper wristbands, Tyvek® is a material made exclusively by DuPont™ and is known for its' tear resistance and comfortable light weight. 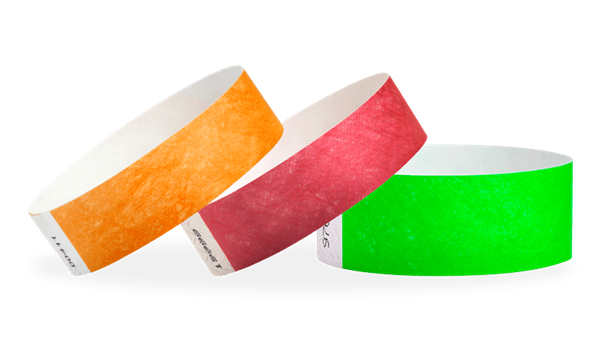 Because of those properties, Tyvek® makes an excellent material for wristbands. The infographic below gives you an at-a-glance look at the features and benefits offered in every first quality Tyvek® wristband. Wristband Resources’ Tyvek® armbands are made with a tamper-proof and non-transferrable adhesive. We use a special die cut on all of our Tyvek® bands which will make them unusable if anyone tries to take off the band. This helps prevent event wearers from trying to swap or sell their bands. Additionally, all bands are sequentially numbered for another layer of protection from illegitimate event-goers or party crashers. Wristband Resources carries 2 different width sizes of Tyvek® bracelets: ¾” and 1”. The ¾” Tyvek® wristbands are the most commonly used bands and are sufficient for most events. They offer a sizable printable wristband area for custom logos, text or graphics. The 1” Tyvek® wristbands offer a bigger printable wristband area to add larger custom logos, text or graphics. All of our Tyvek® event wristbands are 10” long, adjustable to fit any wrist. All inks and adhesives used on our Tyvek® wristbands are waterproof and high-performing. Our Tyvek® bracelets come in more than 20 different, bright vibrant in-stock colors. We also have more than 50 pre-designed Tyvek® bands covering themes from “VIP” to USA wristbands. We also carry specialty Tyvek® wristbands such as “duplicate numbered” security bands for matching two people with the same number on the band (parent/child), voucher wristbands with a tear-able stub (great for raffles, coat checks, free giveaways, etc. ), and tab-free Tyvek® bands to reduce waste and the need to clean up any adhesive tab paper. If you can’t find the band you need in our in-stock section, nearly all of the Tyvek® armbands we carry can be or customized. Go to the custom Tyvek® wristbands page to see our full selection. If you need Tyvek® paper wristbands with special customizations you don't see offered in the custom area (such as unique numbering, barcoding, special printing, etc.) or are unsure which bands will be best for you, please contact us and we can help. Tyvek® wristbands are best for short term use, such as a 1-2 day. They are often used as wrist tickets and for: concerts, festivals, water parks, school trips, night clubs, bars, fairs, resorts, hotels, parks, museums, theatres, breweries, tours, wineries, trampoline parks, arcades, go-kart tracks, fun centers, aquariums, sporting events and more! They are used for so many events people commonly refer to them as party or event wristbands. Yes, tyvek is waterproof and can be used at waterparks and won't come off from a shower. Is tyvek adhesive (tape) waterproof? Yes, the adhesive on our wristbands is made to be so durable it does not come off in water and when you remove the wristband, the adhesive will destroy the die cut. All Tyvek® disposable wristbands are recyclable. For more information on where and how to recycle your disposable Tyvek® wristbands, please visit the DuPont™ website. Design your own Tyvek wristband.